"There are no words left to hear But I’ll reach you, you’ll know I’m near Go on hold on, go on let go We’re worlds apart, but closer than you know In my world, there’s nowhere, nowhere I can’t go In my world, there’s nothing, nothing I can’t do I can climb up to the sky Catch the stars like fireflies Laugh and slide back down without touching the ground On wings of light If you could just see my face in this magical place I’m so much more than okay, not far away Where angels play." That's the first verse of the newly released song, "Where Angels Play", by written by Cheryl DaVeiga and Maria Adubato. DaVeiga is an award winning song writer. 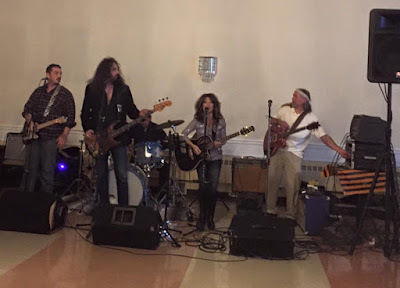 Adubato is a professional singer who performs with the Brother John Brown and the Bell Bottom Blues band. The song was written for the Where Angels Play Foundation, founded by Bill Lavin of the Elizabeth Fire Company. The organization's mission is "to create joyful places to play. To provide hope, recovery, and a return to family values in the wake of senseless violence and tragedy." 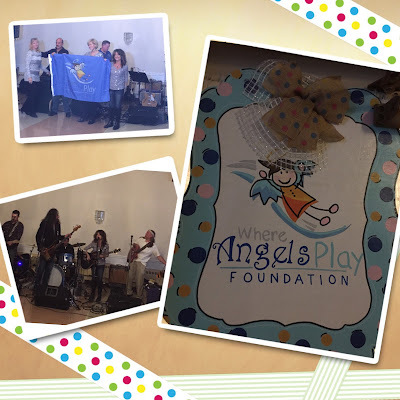 When my dear friend, Maria Adubato, invited us to the Where Angels Play Fundraiser I didn't know what to expect. I didn't get a chance to google the history of the foundation. When I heard the song for the first time, I couldn't help feel a sense of gratitude to have been invited and witness the many volunteers and supporters who are trying to make this world of ours a better place to live. Everyone in the room got teary eyed and was touched by the lyrics and the powerful vocals. You can listen to it for free, share among your family and friends and help make a difference by downloading the song. You can donate as little as $1. DaVeiga and Adubato were given the Where Angels Play flag for their contribution. Before proceeding with the night's program, Bill Lavin, gave a brief history of what "Where Angels Play" foundation is about. Lavin was one of the firefighters who went to New Orleans after Hurricane Katrina and offered help. They ended up building 3 playgrounds. When hurricane Sandy hit the tri-state and then months later the Sandy Hook Elementary tragedy, Lavin thought he could help the two tragedies together by building playgrounds in towns that had lost playgrounds to Sandy and at the same time, dedicate each 26 playgrounds to the memory of a student or schoolteacher who had perished in Newton tragedy. “We built them (the playgrounds) not because of how they died but how they lived. The families loved them so much that the children will be remembered and that their angels will continue to live on through the playground ; Remember who their sons and daughters were and who their beautiful teachers were. We completed the project in 19 months and raised 9 million dollars. 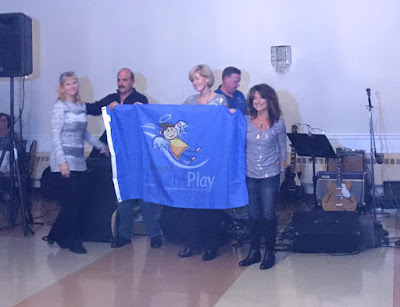 BUT the real heroes of the project are the moms and dads of the 26 angels because they decided that they will heal through healing and decided that the 26 playgrounds were not enough and they want to pay it forward to places like Boston, Wilmington, and back to Mississippi, back to New Jersey. "To learn more how you can volunteer and/or donate, please visit www.whereangelsplayfoundation.org. Don't forget to listen, download and share the song, "Where Angels Play"